With the rising phenomenon of high school and college students deep in credit card debt, the question for each parent is, “should my teen have a credit card?” Surveys show that college freshmen have an average of $1,585 in credit card debt. This amount is certainly no joke. One college student shares her experience of how she feels strangled by debt, wishing she could just pay everything off. With three jobs and bills to pay, it’s hard to believe she’s only 19 years old. There are always two sides to a coin, and while some parents believe that giving your child a credit card will teach them financial responsibility, others argue that they’re just not ready for it. Janet Bodnar, author of “Raising Money Smart Kids: What They Need to Know About Money And How To Tell Them”, explains that credit is not real money to teens. “It’s a license to spend, and they’re not learning how to manage money on their own.” Because of the rising statistics of teens in debt, it’s an opinion that’s well worth considering. So how do you prepare your teen for financial responsibility? There are a couple of steps you can take before going out to the big leagues. 1. Financial education – This is where everything starts. Educate your teen about money and allow their minds to be opened about wise investing, budgeting, and even mind setting. Expose them to different kinds of media such as financial books, audio-visuals, and even seminars. One day, they will thank you for it. 2. 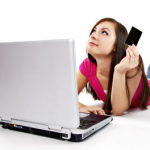 Start with a prepaid debit card – A debit card for your teen is a smarter choice than a credit card. This gives you some degree of control since their spending will have a limit. Strike a deal with your teen such as having a set amount that should last for the month. Be strict about your rules and let them know that when they’re on their own, there won’t be anyone to give them more cash when they run out. 3. Move on to a checking and savings account with debit card – When your teen gets his first part-time job, he’ll be having money that goes straight into his account. Having these accounts will allow him and you to monitor the spending through the monthly statements. Over withdrawing can be subject to penalty, and this is a responsibility your teen will have to face. Then again, a penalty is better than a steep credit card debt. When introducing credit cards to your teens, the most important aspect will always be financial education and maturity. Once they understand the weight of possibly getting into debt, and how they can manage their finances better, the more control they will have. Be open to your teen, and if credit cards aren’t necessary yet, there’s no need to give them one. No rush.